Infinito Wallet Releases Feature Packed Version 2.0! 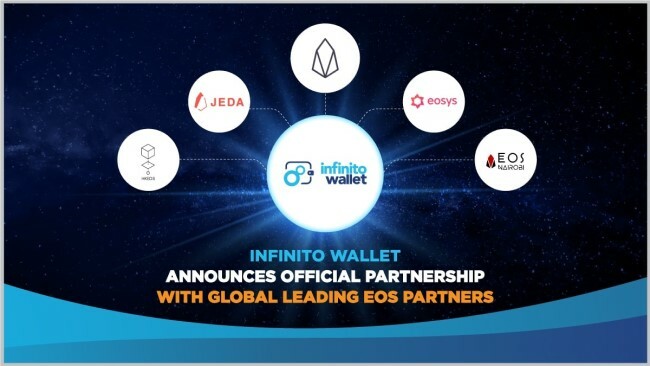 Our collaborative partner, Infinity Blockchain Labs Europe Co. Ltd., is proud to announce that its project, Infinito Wallet, has just released Version 2.0! This major update is the biggest since the wallet’s launch last year. 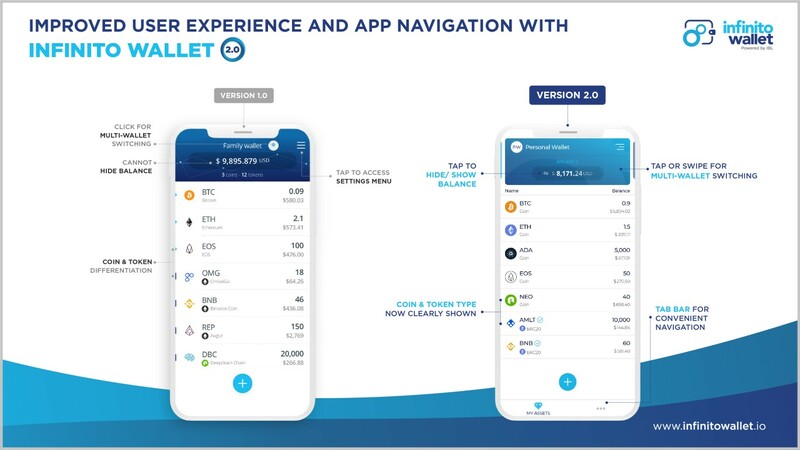 With the help of Infinity Blockchain Labs (IBL), the team worked hard to deliver a user interface and user experience (UI/UX) design upgrade that looks terrific and functions conveniently! This major overhaul offers a wealth of exciting new updates such a beautiful fresh design and convenient features such as Import Wallet by Private Key, Night Mode, Tab Bar, new language support, and many more. These new updates help Infinito users personalize their wallets. The Import Wallet by Private Key feature allows users to import private keys of all virtual currencies that Infinito supports: ADA, EOS, Ethereum, NEO, Bitcoin, Litecoin, Dash, Bitcoin Cash, ETC, Dash, Dogecoin and more than 20,000 tokens of ETH ERC20, NEO NEP-5, and EOS. 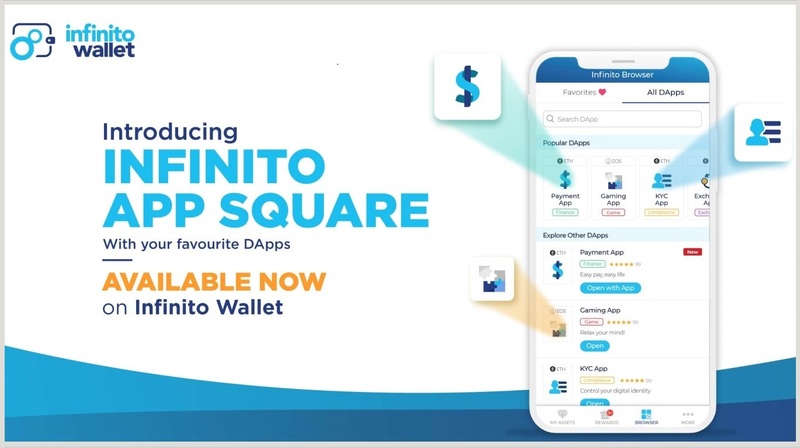 Here is an overview and guide of some of Infinito’s new updates! 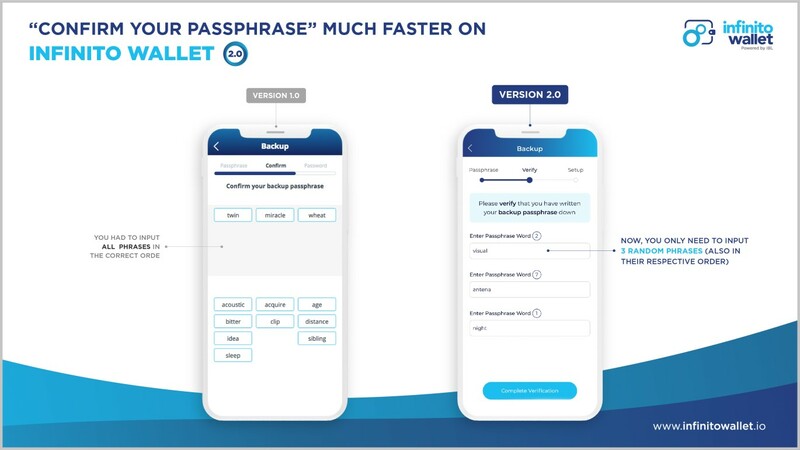 In addition to the current means of creating a new wallet, Create New Wallet and Import Wallet by Passphrase, users will have the new option to set up a wallet with Import Wallet by Private Keys. 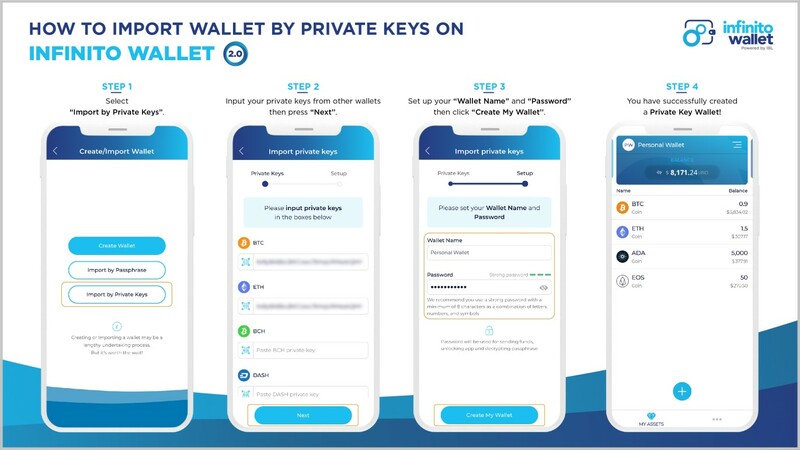 This new feature allows users to import the private keys of the virtual currencies currently supported by Infinito Wallet that the user has stored elsewhere such as other wallets or hardware devices. Note that a Private Key Wallet does not have a passphrase. To ensure the safety of Private Key Wallets, please keep its private keys safe. Additionally, when creating a new wallet, users are now required to input, according to the corresponding order, only three randomized words from one’s passphrase rather than a 12-word seed. This convenient update saves users time and does not undermine security. 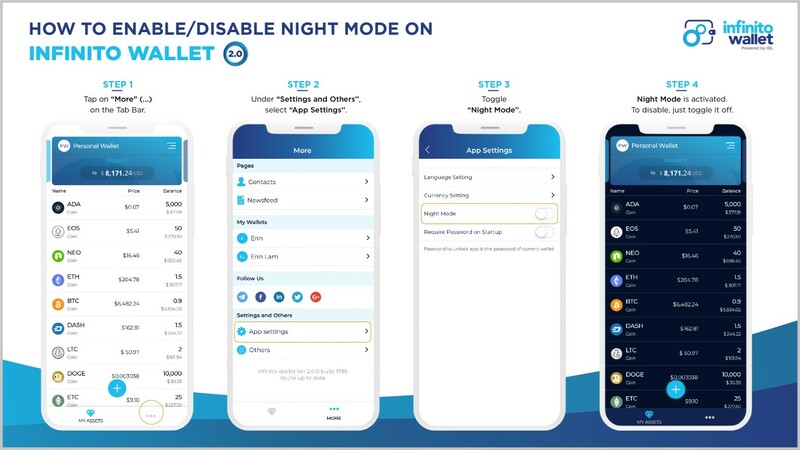 Night Mode seems to be the craze these days and Infinito Wallet has followed suit! Users can now save strain on their eyes and apply a dark background with contrasting light-text. 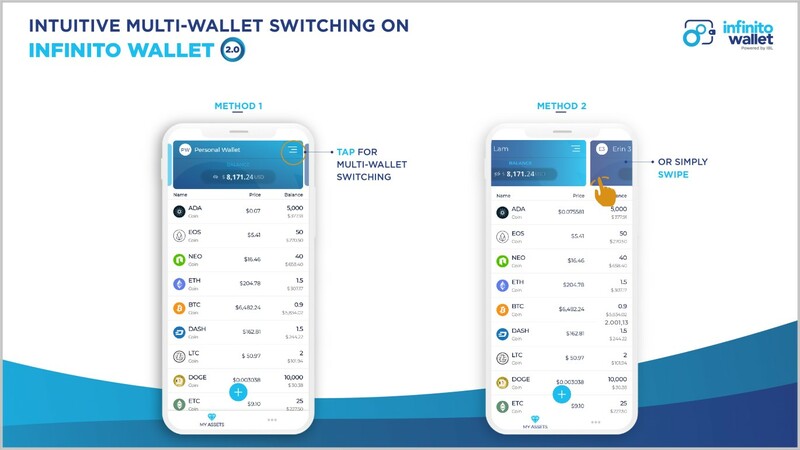 To quickly manage multiple wallets, the team also added the ability to swipe between portfolios to quickly access different wallets. Also, now you can tap the side menu icon on the right, which will open Multi-Wallet tray rather than Settings. The new Tab Bar makes app navigation easy! You can easily switch between two activity tabs: My Assets and More. • My Assets tab is your wallet Dashboard. • Essentials such as Settings, Contacts, Backup Passphrase, Export Private Keys, etc. is now accessed via More tab. In a later update, users will be able to customize their Tab Bar! Stay tuned! The team has added many new features to make the UI/UX more appealing and intuitive. Check out some of the examples. These new updates let Infinito Wallet users customize their experience more than ever before! The team wants to hear your thoughts on the new update so they have included a “feedback” button in the application’s features. Feel free to tell your thoughts on the new design! Infinito Wallet is expecting big updates in the coming months! 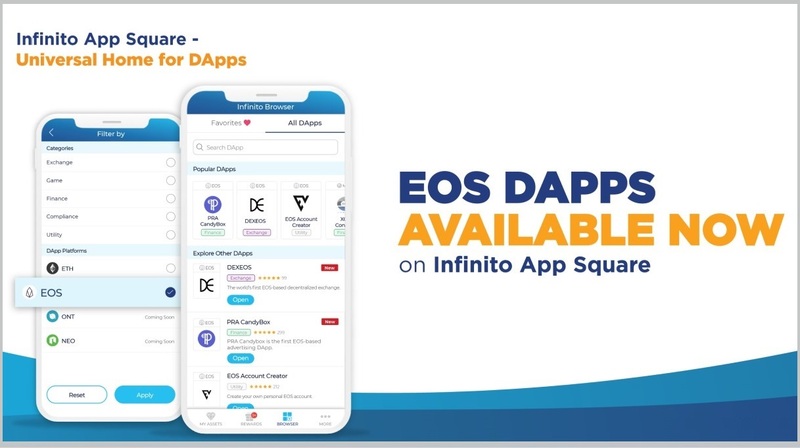 Future updates will bring users the ability to view their multiple portfolios from other wallets or exchanges right on Infinito Wallet app with Portfolio Management feature. 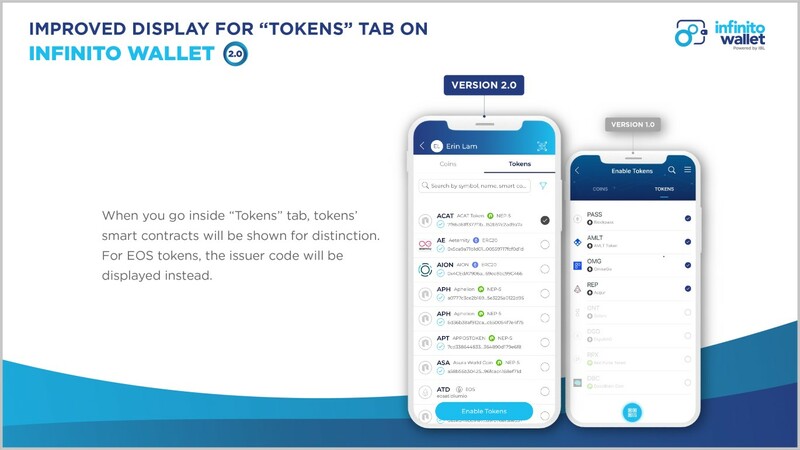 The team will also be making the Tab Bar heavily customizable, allowing for import Exchange Wallet to monitor your assets on exchanges, check risk of crypto profiles, and much more! Additionally, Infinito wallet will welcome Ontology to its always growing list of supported virtual currencies. There will soon be even more virtual currencies integrated into the leading universal wallet such as XRP, NEM, XLM, and ICON. The Infinito Team and IBL R&D Lab tech contributors sincerely hope you enjoy Version 2.0 and hope to hear informative feedback.